ReKruiTIn.com , India's leading Job Site: Career Counseling – Do you know what you are in for? How to Perform in your Interview? 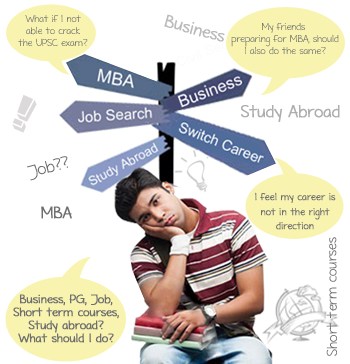 Career Counseling – Do you know what you are in for? Counseling can play a crucial role in the career choices of a student. It is a process that helps a student determine the right career option through evaluation of the student’s aptitude, general interest and other relevant qualities. Hence, it is advisable to have regular counseling sessions, which will help identify the right career choice for an individual student. Identifying the right career for a student is, however, a difficult task. It involves thorough analysis of several factors, and accordingly guiding the student. There are various elements that influence this process and if the evaluation process is not right, it may lead to incorrect career choices. A student expects the right advice from a counselor and hence the right methodology needs to be followed. In order to facilitate this, counselors must ensure that students feel comfortable while speaking with them, and share their own opinions and thoughts for the facilitation of a dialogue. Counseling must start early, so that the process can be given sufficient time and the student as well as the parents are advised properly. It is feasible to start the counseling process while a student is in the 9th standard, and this process must continue, through frequent sessions, till the time the specialisation of the stream is determined in class 11th. Career counseling needs to go beyond testing the aptitude of the students and must include identifying the interest of students in terms of career choices. While aptitude determines what can be a good career choice for a student, it may not give a complete picture. It is equally important to gauge the level of interest that a student has in a particular type of career and to make the student realise that the interest is genuine and not temporary or influenced by parental or peer pressure. While there are several coaching classes that help students to crack entrance exams, these are not synonymous with career counseling centers. Counseling must begin much earlier and should continue till the time the student is able to make the right career choices. Coaching classes cater to a limited number of career choices - the ones that are termed as ‘top career options’ by students and parents. However, in today’s scenario, there are many career options available that help students utilize their potential to the maximum. Many of these options did not exist earlier and are beyond the realm of traditional career directions. Counseling, therefore, plays a critical role by not just helping students and parents in identifying the potential that a student has, but also by providing them information about various career options that might suit a particular student. Counseling encompasses a larger perspective and must have contributions from not just the counselor, but also schools and parents. A counselor may just facilitate the process, but schools and parents need to guide students in terms of the recommendations made by the counselor. This would ensure that the students make right career choices.